Note: This project is old and for reference only. I suggest nowadays to use a DC-DC converter instead such as LM2956. This is more efficient and will allow the full range of voltage control without generating any heat. Myself, well I only have extremely cheap 80mm fans (they came out of dead AT PSU's), and I decided that one LM317T regulator would do all 5 fans with no trouble. So I have adopted a much cheaper approach to the solution and also smaller too. I will also show you how I connected the circuit board to the spare blanking plate in my last 5.25" drive, and give a sample layout for stripboard PCB. Update: Note that an LM317T regulator is a linear regulator and has a drop-out voltage of up to 2.5V. This means even at the maximum adjustment, the fans will receive only 9.5V, not 12V. The other components I used (and that I had already) were an aluminium heat sink with mica washer and nylon screw/nut, a DPDT slide switch, a power connector for the PC motherboard and some wire. This gives me a total of £2.37. For others the bill wouldn't exceed £5-£7 depending on the need for wire etc. This makes this circuit a very cheap and useful addition to your PC. I have the fans set on low at the moment as my desktop is just being an internet server at this moment as I am writing this article in bed on my laptop. Its nice and quiet and you don't realise how loud it used to be until you switch the fans to full. If you want to use this layout, which works well except for the reverse directions on the potentiometer, then below are further details you will need to know. It horizontal line is the break in the strip of copper, with each circle obviously being each hole in the board. Where a circle is filled black is where you would insert component pins and solder them the the copper strip behind. When soldering, do not use much heat, the components are not very forgiving. The brown circle is where you need to break the copper track behind. You can buy special tools to do this neatly - but I just used a 2.5mm drill bit and went it slowly until the copper had been removed. Do not go through the whole board. 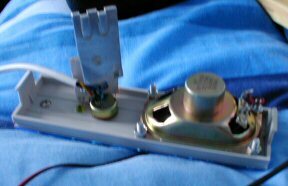 Another alternative is to chop that un-needed pin of the potentiometer - a bit like it is done in the article. It will then not need to be soldered at all and two pins should give you enough stability. Resistors are the blue coloured ovals. The 270/240R one is wired vertically, just insert the first pin, the bend the next one through 180 degrees and insert it in the hole next to the first pin. The resistors are not fussy about which way round they go, however the rest of the components are. It is unlikely that you will get the potentiometer the wrong way round, however the LED is easy to get wrong. 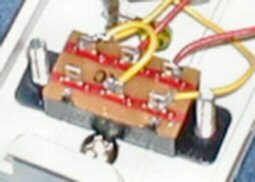 There is an anode and a cathode - the anode must (longer lead) must connect to the resistor, whereas the cathode (short lead) goes to the wire that leads to ground (that's the bottom strip on the board). Finally, connect the wires. They will need to be stripped of the insulation by about 3mm, then soldered to the board, carefully. 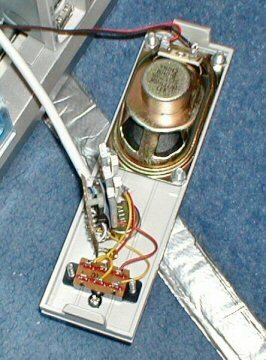 Don't forget the wire that runs on the right of the board or the LED will not work (its needs ground). The heatsink I used was fairly big in size and it is unlikely that something would be needed quite this big, the device seems to run cool. The pictures also show the yellow LED glowing. This is almost as expected - and at this voltage, the LED does not glow and any 12V will definitely not spin. Adjusting the voltage seemed quite linear and the circuit does give you a good degree of control between these two voltages. All separate - the silver backing, the blue acrylic and the grey plastic blanker. 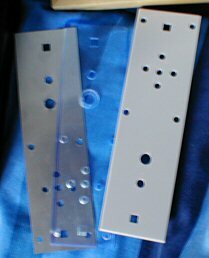 All three parts mounted together. With speaker and fan controller added. When drilling holes for blanking plates similar to mine, you need to make sure that you mark and drill on the front. I wasted one of my spare plates as I found out that the acrylic is easily cracked when it is drilled from behind. Also, the potentiometer will not reach through the plate fully, so I had to sink a larger hole in the front to recess the mounting nut. I used a high speed drill bit to do this - if you do too, make sure you do the recess before the hole, other wise you will have a 7mm hole which does not provide anyway for the high speed drill bit to guide into (it makes it own, smaller initial hole). Once the recess is done, you can then widen the hole it leaves with a drill bit. The back of the whole plate with extended wiring for the switch. Wiring on the switch itself. The picture on the left is my PC tower case with my new mod in and working great. At the moment the switch is selected up - which enables the fan controller. At maximum speed, it is enough to make all the fans almost inaudible compared to the processor fans and hard drives. When my CPU temperature starts to get to a point which I am not happy with (about 55 degrees perhaps), I can throw the switch and my fans will speed up to maximum speed as they get the whole 12V they need to run fast. This switch also turns off the fan speed controller and the LED goes off. I am also happy with the speaker, 5 holes is enough to hear the diagnostic voice audibly and it sounds clearer then I have ever heard a PC speaker before - maybe I will do an amplifier mod to allow me to connect the sound card. It looks great, there are a few light scratches where I slipped unfortunately, but nothing that stands out much. I am happy with the look of the plate. 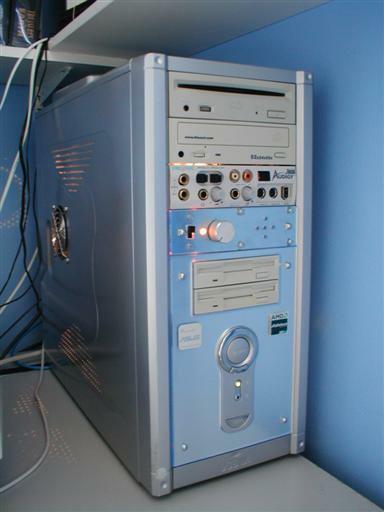 The picture is updated showing a picture of my PC with the silver knob connected (I ended up getting the medium sized one as there was none of the small ones in stock at my local maplin store). My next plan is to also get an 80mm fan for the CPU heatsink and a 60mm to 80mm converter so that it can be mounted. Bigger fans provide more airflow per rpm, and I can run the CPU fan slower and make my machine nice and quiet. I have changed the the 270 ohm resistor to 240 ohm as specified and so far I see no difference in fan speed at maximum power and the bypass switch is still needed. I also changed the schematic, which is incorrect, the new one should be right.